Exploring and preparing data is a crucial step in every data science project. The handling of missing values influences the accuracy of the subsequent inference. If the relative amount of missing values is negligible it is safe to exclude the affected rows from the analysis. This extension supports the exploration and preparation process by providing summary statistics on missing values and the capability to filter out rows which contain missing entries. Note: If the entire data set does not contain any missing values the entire data set is returned as an output, irrespective of the specification of the parameter “Output”. The algorithm summary always includes the entire unfiltered data set. No missing values: If the data set does not contain any missing values we’ll let the end-user know. 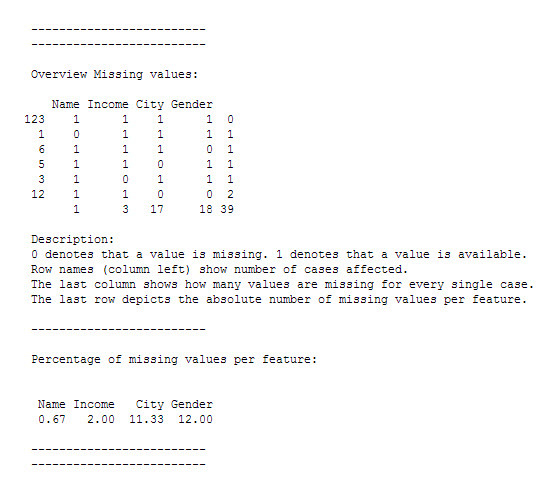 Overview missing values: A table to get a better understanding of the pattern of missing data (Please refer to the example for a detailed description of this table). Percentage of missing values: A table with the percentage of missing values for every feature. The first two rows of the table read as follows: There are 123 cases which do not contain any missing values. There is one case which contains a missing value for the variable name. The first column shows the number of rows affected. The last column shows how many values are missing for every single case. So for instance, the third row reads: In six cases there is one missing value. This missing value is for the variable gender. The last row sums up the absolute number of missing values per variable. The absolute number of missing value for the entire data set is depicted in the last cell as 39. The second table displays the percentage of missing values per variable. As a rule of thumb if missing values for a feature exceed 5% one should exclude this feature from the subsequent analysis. This is the case for city and gender with 11.33 and 12 percent. Please note that this component is provided as-is without any guarantee or support. Please test the component to ensure it works for your purposes. The R code and the GPL3 license can be found in the package appstamDC (Appstam Data Check). If you have any suggestions or project inquiries, feel free to contact us under info@appstam.com. Thank you for your feedback.